After last weeks fantastic win over Chelsea, the weekend trip to the Capital to take on West Ham cannot come quick enough. Ahead of the fixture we have spoken to West Ham fan Jack Lebeau for his views on the Hammers, Everton, The Premier League and his thoughts on Saturday’s game. You can follow Jack on Twitter @jacklebeau98. How pleased are you with West Ham’s start to the season? Have the fans accepted Sam Allardyce’s approach yet or do you still long for a return to West Ham’s traditions of passing football? I’m pleased with our start defensively; conceding none from open play in five games is clearly a sign we’re doing something right! However, in them four league games we’ve only scored two and they both came in one game, thus making us the most boring side in the Premier League to watch so far. I think we have had two decent away points up at Newcastle and down in Southampton but losing to Stoke at home was very disappointing. Sam Allardyce’s approach gets us the results, but football is about entertainment and sometimes it would be nice to get some; especially at home. The style of play could be better even if it isn’t as bad as most people make it out to be. I would expect you to improve on last season, what are your hopes for this year? A cup run and a mid-table finish would be very acceptable. Andy Carroll appears to have suffered a setback in his return from injury, how much of a blow is that? It’s a huge blow, the injury leaves us worrying as to where our goals are going to come from in the foreseeable future. His overall impact on the team is enormous, he controls the air and links up well with Jarvis and i’m sure he will with Downing too when they both return from injury. The club made a number of signings, further strengthening all areas, who do you expect to make the biggest impact? It has to be Andy Carroll, our only proper striker and our club record signing, even if he was here last season! Stewart Downing is still a good winger despite his blip at Liverpool and we’re all hoping he can return to his form that made him a £20 million player in the first place. Razvan Rat and Adrian are solid signings to improve our depth too. Our loan recall in Ravel Morrison from Birmingham City will also be like a new signing, he has made a huge impact in pre-season and in the league so far despite only being aged 20. What are your thoughts on the transfer deadline? Were you disappointed not to add another top striker? Transfer deadline day for a West Ham fan is rarely fun, like most clubs about ten different names were rumoured to be having a medical at Upton Park and about three were rumoured to be leaving but in the end none signed and none left. It was highly frustrating, especially as now Andy Carroll has suffered a setback in his injury recovery. West Ham are leaving Upton Park behind in a couple of years and heading to the Olympic Stadium. What are your thoughts on the move? Part of me wants to leave as we do need to move with the times and we can’t stay at Upton Park forever, we have a huge opportunity to move to one of the country’s best stadiums and in doing so clear off all our debt. However it will be sad to leave Upton Park, especially with the huge history that will be left behind. The last game there will be highly emotional. 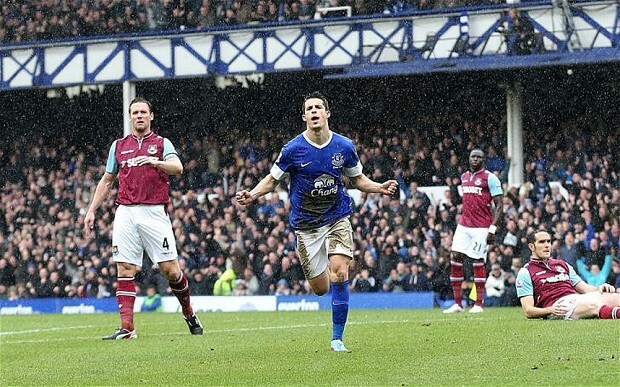 Everton always seem to do well against the Hammers, what were your thoughts on Everton last year? Everton were a brilliant team last season and their home form was key to their good finish in the league. I thought Everton were huge contenders to win the FA Cup last season and might well have done if they’d have turned up at home to relegation candidates Wigan Athletic. Everton are one of our bogey teams, especially away from home but it’s always tight between us. We are under a new manager for the first time in 12 years, what are your thoughts on Roberto Martinez? Some Everton fans on Twitter were calling for David Moyes to get the sack last season as they were concerned and bored with his negative and defensive view to playing the game. Roberto Martinez is a huge contrast, he plays some good football and deserves the chance to manage a top team after the heroics he performed at Swansea and Wigan. Where do you think Everton will finish this season? 7th. Everton had a relatively poor start but their win against Chelsea last week was a huge boost, I can’t see them finishing above their Merseyside rivals Liverpool this season (unfortunately). Which Everton player if any would you like to see at West Ham? If no one, who do you most admire? Romelu Lukaku or Leighton Baines. Our defence isn’t a huge priority but Baines is a top player. However we need a striker desperately and Lukaku is absolutely outstanding and would suit our style of play. He was rumoured with a move to Upton Park in the summer but unfortunately it didn’t happen. The surprise package? Liverpool have had a great start to the season and if they can keep it up then they could quite easily secure one of the coveted Champions League spaces which few would have tipped them too a month ago. Relegation Candidates? Hull and Crystal Palace are likely to be the main two but I can also see Sunderland struggling, Paolo Di Canio might have the passion but not the experience. The best signing? Mesut Ozil. Player of the Year? Mesut Ozil. Top Scorer? Robin Van Persie. What is your score prediction? (Very optimistic) West Ham 2-1 Everton. What do you expect to be the starting XI? Jussi Jaaskelainen, Guy Demel, James Collins, Winston Reid, Joey O’Brien, Ravel Morrison, Mark Noble, Mohamed Diame, Kevin Nolan, Matt Jarvis, Modibo Maiga. Which West Ham player should we look out for? Ravel Morrison. Our best creative/attacking player and he’s only young. Previous Post Why don’t we utilise the bench?